Criterion couldn't have chosen better than Wim Wenders' luminous Wings of Desire (Der Himmel über Berlin) for Blu-ray release. The mysterious, lyrical fairy tale is stylized to present 1987 Berlin as a sad city divided by an oppressive wall. "Heaven over Berlin" reaches back to classic German Expressionism for its effects yet has a very modern surface. It became one of the most popular art films of the 1980s, advancing director Wenders into the league of great world filmmakers. The citizens of the gloomy West German capitol worry in silence about their families and responsibilities, unaware that a host of meditative guardian angels is keeping silent watch. These quiet, thoughtful figures gravitate toward souls in distress, soothing them with their invisible touch. The angels are in awe of the human spirit; every so often one desires to be alive so much that they make the transition to the "real" world. Melancholy angel Damiel (Bruno Ganz) falls in love with a beautiful trapeze artist, Marion (Solveig Dommartin) and takes the plunge into mortality. Watched over by his comrade Cassiel (Otto Sander), Damiel experiences the taste of food and the chil of the cold. He receives special tips from another former angel, actor Peter Falk (Peter Falk), who is shooting a movie in Berlin. Marion's circus has disbanded, forcing the no-longer-omniscient Damiel to search the city for her. The Wim Wenders achieves a contemplative tone difficult to describe. The angels that wander the Berlin thoroughfares and loiter in its public places are glimpsed with wings only once or twice. Invisible, they listen to the living with sympathetic eyes and ears. All thoughts are audible in the angels' world, filling trains and street corners with inner voices looking for answers. The angels come close when they're needed, comforting those who suffer. Although they can't change reality, the Angels can raise the spiritual morale of those they touch. We feel a profound uplift when Damiel brings a glimmer of hope to a discouraged man on a train. These phantoms appear to be God's Lonely Men (and women), constantly hovering about us, connecting with our spiritual selves. Damiel attends to a victim of a traffic accident as he sits dying by the curbside, perhaps already perceiving the afterlife and vaguely aware of Damiel's presence. Innocent children can see the angels, and accept them for what they are. A child points to a winged angel standing atop a tall building, but his parents pay no attention. Wings of Desire's emotions become personal through Damiel's love for Marion, the beautiful trapeze artist. He watches her rehearse and perform for a children's matinee in the modest little circus tent. 3 The angel then experiences "intimations of mortality" represented by short cuts to color -- the way normal humans perceive the world. This taste of life convinces Damiel to forego his immortality in favor of the short years of one mortal lifetime, as a living person. The formerly serene spirit is suddenly reborn into the world he only thought he knew. He asks strangers the colors of things and sticks his nose in a cup to smell the coffee. Damiel learns what being cold is like and how frustrating it is to be hindered by things like chain-link fences. We want to clap as he discovers, one after another, the marvels of human living. After an hour of teaching us to appreciate the spiritual, Wings of Desire rejoices in the miracles of everyday reality. Peter Falk's ex-angel introduces an element of amusement. We listen to the actor's thoughts as he sketches extras or observes preparations in a bunker being used as a movie set. Falk teases Damiel and assures him that the real fun will be discovering life for himself. For Damiel, this means tracking down the missing Marion. The circus has left town, and he can only hope he'll find her in the street, or at a concert. And when Damiel does find Marion, how will he declare himself? Wenders receives excellent creative help from the legendary Henri Alekan, the cinematographer of Cocteau's Beauty and the Beast. The film's visuals shift from silvery God's Eye aerial views to the dim rooms and streets of the city below. Jürgen Knieper's music is dominated by soulful violins and cellos. The circus orchestra and the droning Rock music of Nick Cave provide a good contrast, but the string passages establish the ethereal atmosphere. Wenders would use similar music and a dozen disparate pop songs brilliantly in the science fiction masterpiece that Wings of Desire made possible, Until the End of the World. 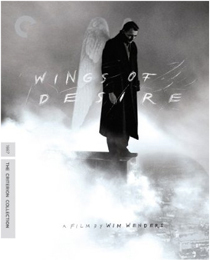 Criterion's Blu-ray edition of Wings of Desire is a wonderful addition to the top rank of favorite discs. Wim Wenders supervised and approved the Hi-Def transfer, which replicates the theatrical experience without the flickering and scratches. The transitions between B&W and color are finely judged. The HD resolution shows the B&W grain as a very fine pattern -- the film frequently resembles a photographic art print, that moves. The extras were all sourced from the director; some were on MGM's standard DVD released six years ago. A comprehensive docu called The Angels Among Us explains the film's odd genesis. After years of 'road pictures' and work in America, director Wenders searched for a significant "German" theme to mark his return home. An interview and a docu excerpt highlight the contribution of Henri Alekan, then over eighty years old. The docu shows us Alekan's favorite camera filter, a women's stocking from the pre-war days. The docus also show the process of deciding how the angels should be costumed and how they should behave. A long selection of deleted scenes will amuse fans, as several go off in odd, unconstructive directions. Galleries of art designs and trailers are included. The audio is in the original German, French and English with English subtitles. It's been pointed out that nothing in Wings of Desire indicates that its angels are Christian in concept. Earthly churches play no part and the angels never go to a temple or a chapel to find troubled souls. Wings of Desire avoids the pitfalls of most other fantasies about the afterlife by not imposing a specific moral structure on its cosmic fairy tale. Supplements: Audio Commentary with director Wenders and Peter Falk, docu The Angels are Among Us, French TV program excerpt, interview with Henri Alekan, deleted scenes, outtakes, excerpts from film Alekan la lumière; film Remembrance: Curt Bois, notes and photos galleries, Trailers, booklet essays by Michael Atkinson and input from writer Handke and Wenders. 1. Arthur C. Clarke's novel Childhood's End provides a beautiful parallel to Wings of Desire in classic Science Fiction. A super-race of gigantic aliens come to Earth not to conquer, but to study us, for we humans possess something they do not: consciousnesses that can proceed to a new level of existence, i.e., immortal souls. 2. When the film was made in 1986-87, nobody could have guessed that the Berlin Wall would be history in just two years' time. Wings of Desire is a key film about what the division really meant. Wenders' followup feature Faraway, So Close is a joyous elaboration on this story, but set as it is in a reunited but undecided Germany, it has political complications that unbalance the first film's simple setup. Its new fallen angel, for instance, develops an alcohol problem. 3. If one hasn't already completely charmed by the film, the circus scene will do the trick. Here is a tent-full of little kids, none of whom seem to have been spoiled by video games or reality TV, reacting with sheer delight to the antics of the spirited performers. The only thing remarkable about the circus is the wonder of the audience-performer relationship -- the actors give the children their attention and love, which the kids accept without reservation. The kids get to jump up and join in the fun, batting balloons and playing with the clowns and the cat lady. It's a moment of humble rapture. We take our kids to circuses and zoos to inspire these kinds of reactions, but the influence of television is so pervasive, by age four it's almost a lost cause.